Over the summer of 2013, I decided to take a break from my usual digital collage style and focus on drawing, which is how all of my creative projects begin. I needed to look no further than my daily voyages around my home town of New York City for new subject matter. There always seems to be someone or something interesting to see when I’m out and about. My keen sense for finding humor and nuance in the everyday probably has something to do with it, but I often begin a work commute or a walk thinking “I wonder what kinds of characters I will cross paths with today?” and I am rarely disappointed. I know there are a lot of people out there who “<3 NY” so I began this series as a way to send some of that love back; from the city and from me. Visit The Nancydraws Shop on Etsy.com to purchase any of these as original art. “Turban Lady” was my first idea for the “Love, New York” series. I actually saw a woman dressed this way while on a walk in Times Square on a winter afternoon. I really wanted to stop and ask her more about the outfit and who she was but she was on her phone and moving very quickly. The words are from a Facebook post that she also inspired me to write that day. 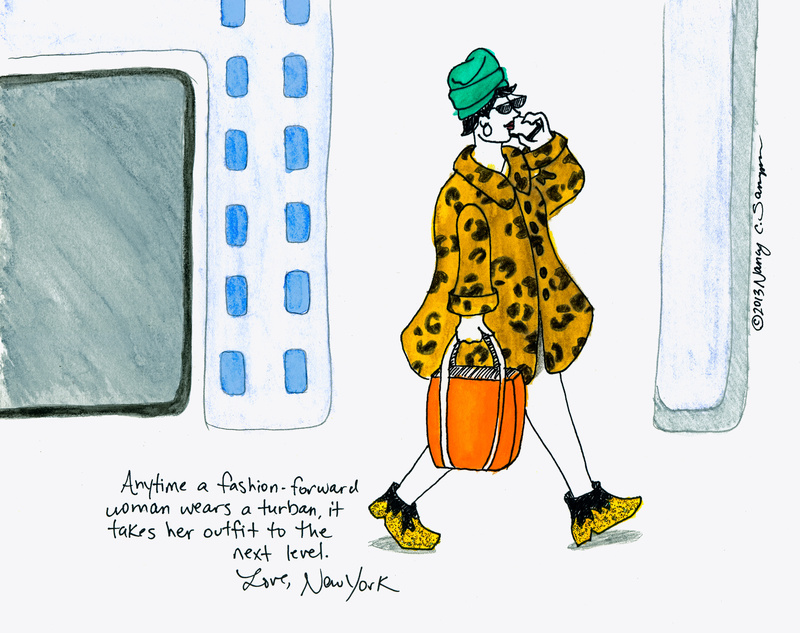 I am always impressed with the fun outfits that I see around town, so I know I will be making more fashion-related drawings in the future. 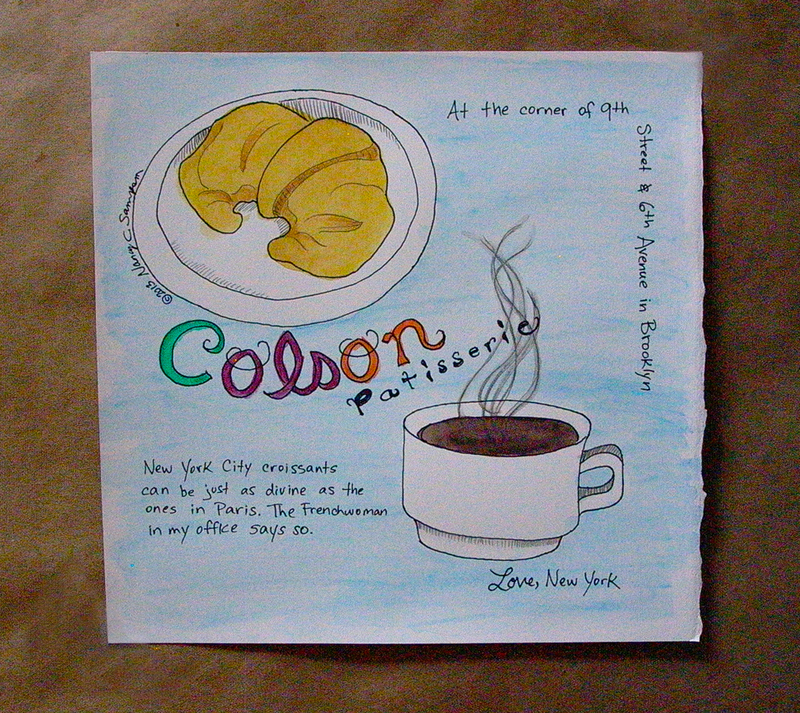 I am lucky enough to live close to Colson Patisserie, one of the best places to pick up a croissant or other baked treats. I brought some of their delicacies to my day job to share with my coworkers and they were very well appreciated. Stop by their place if you’re nearby! 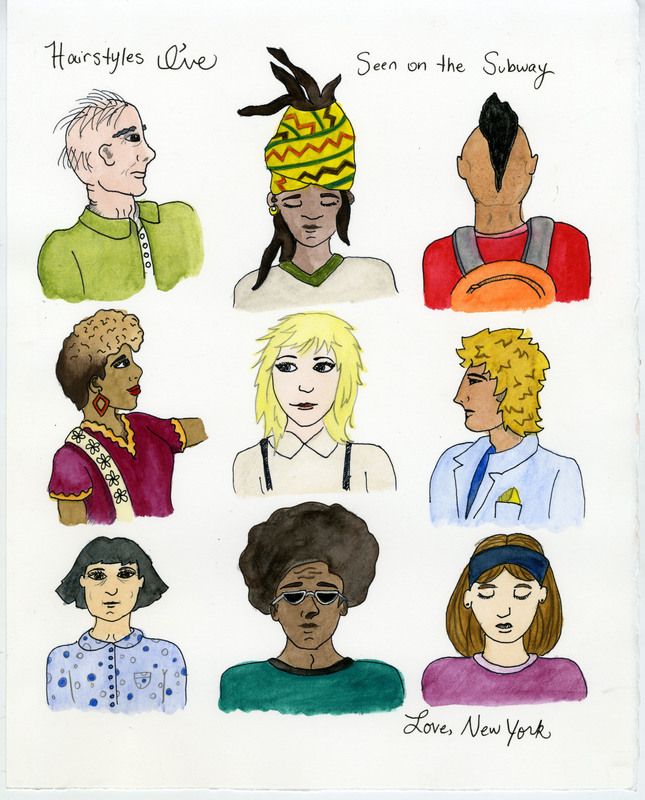 As a frequent subway rider, I see quite an array of hairstyles as I travel around the city. Some of the styles I’ve shown here are ones I’ve seen repeatedly on various straphangers, while others are more unique and striking. Diversity is just another reason to love this town, so naturally this piece fits in with the “Love, New York” series. Don’t be surprised if I come up with sequels on this theme.